Best 3 Games with…Territory Building! Isn’t Territory Building the same thing as Area Control? Not necessarily! I guess the main difference is with Area Control there is fighting and changing of territory. With Territory Building usually once you influence that area, it can’t be changed or taken away. Some would say this is the Euro style of Area Control, more solitary and less conflicting. There are plenty of different Territory Building games out there and some do it better than others. This list comprises the games that I feel do it the best or the most uniquely, not necessarily the best games with that mechanism. These games have that mechanism that does it the best. It may not even be the main part of the game, but it does it well. That being said, let’s find out what I think are the Best 3 Games with…..Territory Building! Trains is a normal Territory Building game in the sense that you are simply building your rail system is the land of Japan. When yo build your railroads, you simply put a cube down on an area next to one that you have already built. 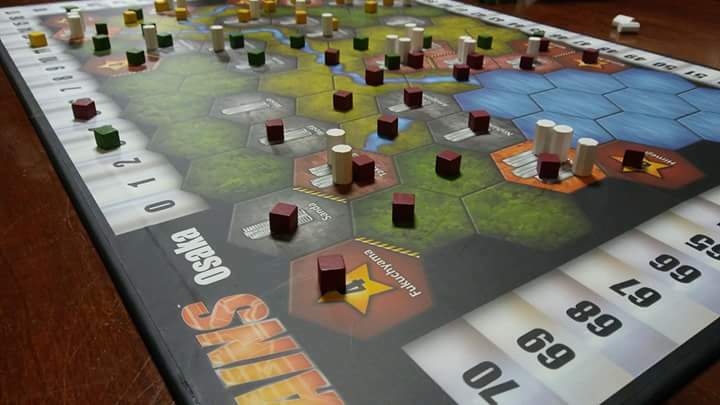 At the end of the game you will score points based on how big the city is that you have a railroad in. The more Train Stations there are in each city the more points……the twist on this is ANYONE can go onto ANY territory. You don’t lose your piece if someone else builds on it, you just both get the points at the end of the game. The key to Trains is how are you going to distinguish yourself from the other players? Are you building up a city only to help give points to others who can just go there also? I really like the simple yet interesting decisions in this design by Hisashi Hayashi. You really need to have a game plan and then find the best way to execute it but not allow others to piggy back on your points. It’s really good! Not sure how many times Castles of Burgundy has been on my Best 3 lists but I am sure this wont be the last. My favorite design by Stefan Feld, is so unique in Territory Building. In Castles of Burgundy, each player has their own player board and they build their territory with tiles they collect from the main board. There are a couple things that make this game so unique in Territory Building, for one all the tiles they put on their board have to match the color of the space on their territory. The other thing is you have to use one of your actions to use your die for the right number of the space on your board. The third is that every tile you add does something unique. some might give you just points, others will give you points at the end of the game or others might give you an additional action to take. The final thing that makes this game so good with Territory building is that all the player boards are different and it is how and when you build that will make the difference in the game. I really love the Territory Building aspect of The Castles of Burgundy!